See below a list of courses I highly recommend playing while on vacation this year in Myrtle Beach. The Dunes Club- One step onto this golf course and you will see why it is one of the most requested courses along the Grand Strand. Barefoot Dye Course- Home to this years Monday After the Master's, you better bring your "A" game with you on this challenging course. Surf Club- One of the best maintained courses in North Myrtle Beach, this semi-private course will be one you remember for ages. River's Edge- Designed by the great Arnold Palmer, this course is nestled along the Shallotte River and offers breathtaking views. 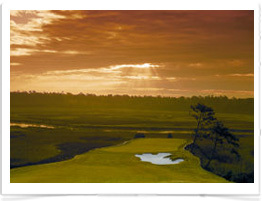 Tidewater- Situated along the Intracoastal Waterway and Cherry Grove, this course has always been a fan favorite. The chilly temperatures are trying to hang on, but in just a few days the weather will be perfect to hit the links.